More Than Words Training, Was this the best PowerPoint presentation ever? PowerPoint has become the go-to tool for most people when it comes to presenting, yet many are overusing it or, worse, relying on it to become the presentation. Perhaps because PowerPoint is so often overused, and even misused, I’m brought in to businesses to help people deliver better presentations. Let me tell you about a rather rare approach. I was working in Basel recently with some process-driven people from a multinational organisation. The aim: to deliver more compelling presentations which included storytelling and which used PowerPoint more effectively. What happened with one of the participants on day two blew me away as an example of how PowerPoint can be mastered rather than relied on. Dominik is an accountant and was delivering a presentation to show people the benefits of using a certain accounting method. Because this particular part of the course was covering how to deliver your message more effectively with PowerPoint, he started off the presentation with the big screen lit up. He introduced the subject, explaining that the old way of accounting was with everything in one big pot. The method he preferred broke into three areas, to allow easier visibility and access. At this point he clicked the ‘blank’ button on the presentation. The screen went completely black and he walked over to a table, which had four clear plastic cups, each containing some water. 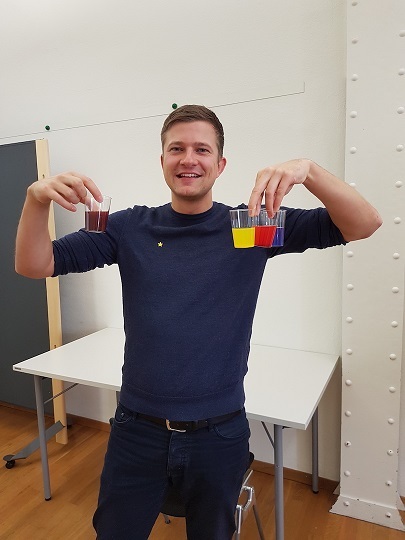 Dominik picked up one cup and added a drop of blue food dye, then a drop into another cup. Two of the four now contained blue water. He then picked up a fresh cup and dropped red dye into it, before squeezing a drop of red dye into one of the blue dye cups. Then he picked up the final clear cup and added yellow dye, with the mixed dye cup also receiving a drop. Finally, he picked up a pencil and stirred each cup. Before he’d even explained the real benefits of the accounting model he preferred, the answer appeared clearly before us: the blue dye had turned the water blue; the red dye had turned the water red; the yellow dye turned the water yellow; but the cup with all three in turned a murky brown colour. As he held the cups up in front of us he explained how his preferred method was much clearer for more people to understand, use and access, whereas the other, single-pot method took more effort to comprehend and work with. A smile spread across my face as Dominik put the cups down, moved away from the table and clicked the PowerPoint back to life; I believe I’d just seen the best PowerPoint presentation in my seventeen years as a trainer. For years I’ve been explaining that we don’t have to rely on the screen, that PowerPoint isn’t the main act, it’s the support and that we are the main act that people come to see. In the break that followed, I immediately asked Dominik if I could take a picture of him with the cups and tell the story of his presentation. You can see from this picture that he was only too happy. By the way, he’s wearing a gold star because I award presenters gold stars when, on average, their attention is 80% out toward their audience, with an allowance of 20% maximum towards the screen. You are, after all, allowed to look at the screen, but it’s how and when you do it that counts. Next time you’re preparing a PowerPoint presentation, use Dominik as a prompt to think about what you can do to make it more interesting for your audience. When you see slide after slide, wordy page after wordy page, the speaker reading from the screen verbatim, don’t you switch off? So, why would you do the same? Think differently and deliver differently. Head over to my articles page to read more explorations of personal impact, professional presentations, leadership and more, and subscribe today for free advice to your inbox.